C&r Pipe And Steel Inc.
National Electrical Contractors Association Inc. Member Profile: Northern Powerline Constructors, Inc. Member Profile: Meridian Management Inc. Member Profile - Grazzini Brothers & Co. Member Profile - Knik Construction Co. Member Profile - Frawner Corp. Member Profile - Travis/Peterson Environmental Consulting Inc. Member Profile - Cli Construction Inc. Member Profile - Bradshaw And Associates Inc. The construction season in Alaska is so short it’s not uncommon for people to get into a rush. But rushing to dig before calling 811 could be a costly and dangerous mistake. Alaska has the dubious distinction of being the state with the highest number of pipeline hits per 1,000 locates. 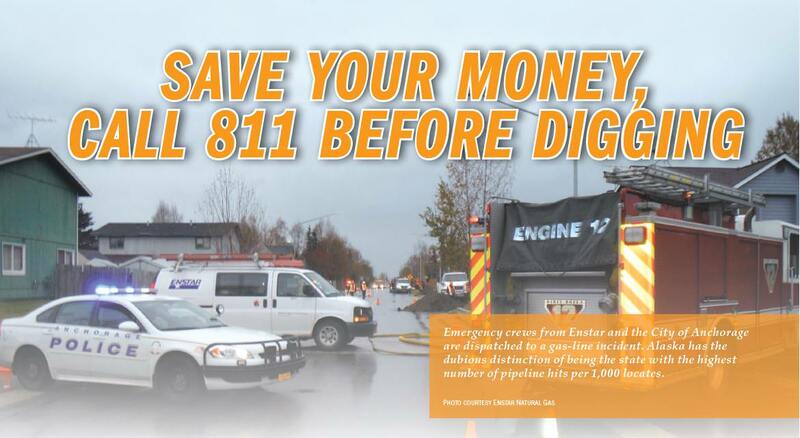 That’s the number of times someone has accidentally hit or broken a natural gas pipeline, compared with the number of times people have called to locate buried lines before attempting construction. The national average is three hits per 1,000 locates, said Alicia Martinez, a safety manager for Enstar Natural Gas Co. Alaska’s average is about eight hits per 1,000 locates, nearly triple the national average. Enstar communications manager Lindsay Hobson said Alaska’s average has come down slightly, from 9.5 breaks per 1,000 locates in 2015 to more than eight per 1,000 in 2017. That’s progress, but Enstar and the Alaska Digline are hoping to bring that number down more. Enstar Natural Gas serves more than 144,000 customers in Southcentral Alaska. Calling 811 before digging isn’t just a good idea. It’s the law. The Alaska Underground Utility Facilities Damage Prevention Act of 1998 requires contractors and homeowners to request a locate before starting to dig. “For us it’s a public safety issue, and it’s an employee safety issue, for both the employees working in the ditch and responding to a damage. It just takes one (pipeline) hit to have catastrophic consequences. That’s what we are constantly trying to avoid,” Hobson said. Martinez said the largest number of pipeline hits stem from companies or homeowners not calling 811 to request a line locate before they begin digging. Sometimes it’s because a locate was called but the landowner or contractor didn’t call 811 again after 15 days had transpired. Having a fresh locate done is important insurance for contractors and landowners, Hobson said. Martinez said contractors and homeowners should also pay close attention to the “tolerance zone” — the 2-foot radius around the locate mark in which mechanical digging is prohibited. “We expect them to either handdig or use non-mechanized equipment in that area,” Martinez said. The most common reason why line breaks happen, Hobson said, is that people don’t call for a locate before starting work. By advertising on every format available, Hobson said, Enstar and the Alaska Digline are hoping to make calling a reflex. “Really, we’re looking for a culture shift. To make that happen, we have to really permeate every level of our society. Whether you’re a contractor or a homeowner or even a kid,” she said. In May, Enstar was wrapping up its 811 coloring contest, requesting school-age children to submit artwork that conveys the “Call before you dig” message. Prizes included a pizza party and a grand prize of a $100 Amazon gift card. While the contest has been fun for kids and fun to judge, Hobson said it strikes a chord with parents. “What people really respond to is the kids’ art. When you see … that children understand the message and the consequences, adults pay atten­tion,” she said. Also, kids have a tendency to ques­tion adults, whether parents or neigh­bors, if they see them doing something they’ve just learned is wrong. “Kids are our safety ambassa­dors,” Hobson said. Martinez said Enstar representa­tives also regularly visit equipment rental companies to encourage them to remind renters to call for locates. You might also see Enstar represen­tatives at home improvement stores or notice 811 messages on Spenard Builders’ Supply reader boards. “As much as we can, we put (the message) out in the most conve­nient places where people will see it,” she said. Martinez said they also host contractor breakfasts and host the Safe Digging Conference, held this year in Anchorage on April 12, where contractors were invited to learn about all aspects of safe digging and speak to line locators from the Municipality of Anchorage, Enstar and other utility operators. A mini-conference was held in Palmer in May and another Safe Digging Conference is planned for August, as the construction pace gets even more frantic as the season winds down. “We see another spike in damages toward the end of the season,” Hobson said. Excavators, whether general contractors or backyard DIYers, need to call Alaska Digline two days before digging to allow each under­ground utility time to schedule and complete the locates. That includes electric, water, sewer and communi­cations entities, as well as natural gas and companies that pipe hazardous liquids such as crude oil, gasoline and diesel. Once a location has been marked for underground utilities, the marks are valid for two weeks. After that time, excavators must call for a re-locate for their project. Calling the Digline is free. Not doing so can mean steep penalties. Because the state doesn’t have an adequate enforcement program, the federal government enforces viola­tions of the one-call requirement. Excavators who don’t call for a locate can face civil penalties of up to $205,638 for each day the viola­tion continues, with a maximum civil penalty of about $2 million. On top of that, Hobson said Enstar is stepping up its own ability to assess damages for line breaks. By state statute, Enstar can assess triple damages if a contractor or home­owner uses gross negligence when working around a pipeline and causes damage to the line. Hobson said the first time a contractor hits a line, they’ll get a bill for actual charges and a warning that if it happens again, damages will be assessed at triple the cost of repair. Martinez said Enstar hopes the combination of carrot, through the form of informational conferences and multiple avenues of encourage­ment to use the Digline, and stick, in the form of the threat of paying treble damages for mistakes, will help Alaska continue to decrease the number of line breaks and increase the number of locates requested. Any contractor who would like additional training on safe digging practices can contact Enstar’s Safety and Public Awareness Depart­ment at 907-334-7793 or contact Mike McCurtain at Mike.mcCurtain@enstarnaturalgas.com. Rindi White is the editor of The Alaska Contractor.